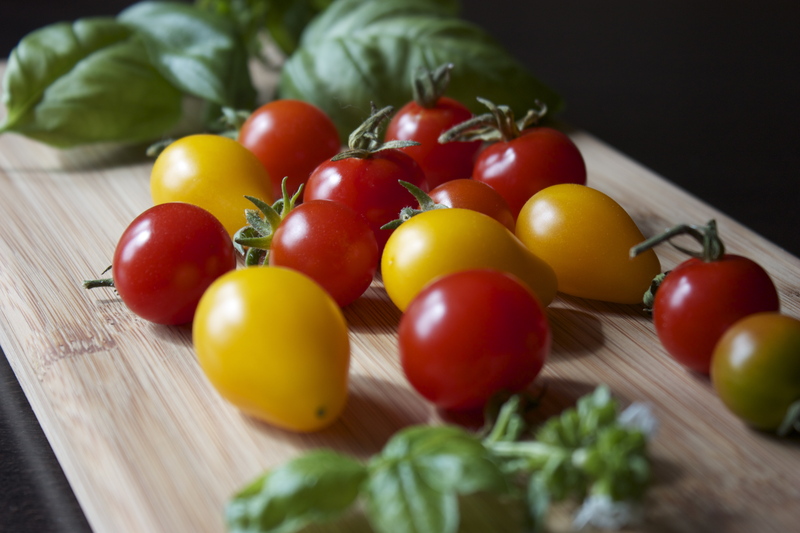 Perhaps there is no better combination of flavors and textures than the classic pairing of tomatoes and basil, whether in a Caprese Salad or in a simple pasta dish. This is specially true in the summertime when the tomatoes are at its sweetest and at its peak of flavor and the fragrant basil grows quite fast. The small basil plant I bought at Trader Joe’s is very happy by my sunny kitchen window and has produced all the basil I need, and much more. It was a much better investment than buying a bunch at the grocery store for the same price. Here’s my recipe for an easy, yet delicious dish using tomatoes and basil. The beauty of the sauce is that you can keep it simple or add whatever else you have at hand, perhaps some mushrooms, sausage, chicken or roasted peppers. In a large sauté pan, heat the olive oil over a medium-high heat. Add the garlic and sauté until golden, about 1 minute. Add the diced tomatoes and red pepper flakes. Cook until tomatoes are soft, about 2 – 3 minutes. Add half the basil and half the parmesan cheese. Season with salt and pepper. Turn heat to low and simmer the sauce for 1-2 minutes. Meanwhile, bring a large pot of salted water to a boil. Add the angel hair and cook until tender, but firm. Drain the pasta, reserving 1/2 cup of the pasta water. Add the cooked pasta directly in the sauté pan. Add the reserved pasta water and toss gently for a minute to coat the pasta with sauce. Season with more salt, pepper, and red pepper flakes, to taste. Transfer the pasta into 2 bowls. Sprinkle with the remaining basil and parmesan cheese. Enjoy!